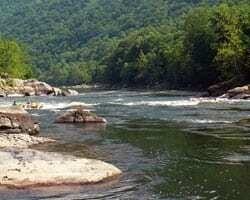 The New River, which is considered by many geologists to be one of the oldest rivers in the world, passes through Ashe County NC along its route through North Carolina, Virginia, and West Virginia. The New River is a tributary of the Kanawha River. Flowing south to north for approximately 320 miles, the New River flows against the normal west to east flow of other major rivers in Virginia and North Carolina. These miles of river create many opportunities for fun activities. One of the most popular pastimes in Ashe County North Carolina is the canoe the New River. There are several companies where you can rent a canoe or kayak and who will provide a shuttle service to and from canoe sites. Canoeing the New River will open your eyes to the true beauty of Ashe County NC. If you’re looking for something even more relaxing, you can also hop on a tube and float lazily and peacefully down the New River. Miles of slowly moving water create a peaceful and quiet opportunity for fishing. Not only can you spend an afternoon floating lazily down the New River in a canoe or passing under beautiful tree tops, you can also enjoy early morning Ashe County NC Trout Fishing. An American Heritage River, the New River is home to many species of freshwater game fish including bass, trout, walleye, muskellunge, crappie, bluegill, carp, and flathead or channel catfish. With this many species living and thriving in the New River, it’s certain that any angler would come home with quite a fine catch. Spring and fall are the best times during the year to fish the New River. There are several catch and release areas along the New River ensuring fishing opportunities for everyone for years to come. 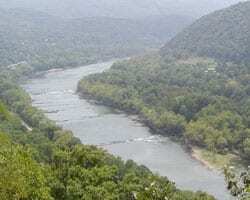 The beauty of the New River is known by all and there is a valiant conservation effort surrounding the New River. Some of the best Ashe County NC Trout Fishing can be found along the New River in West Jefferson North Carolina. The experienced Ashe County NC Realtors at A1 Mountain Realty have a wealth of knowledge about everything in Ashe County North Carolina. If you are looking for a summer vacation home or a winter escape, A1 Mountain Realty has the Ashe NC Mountain Real Estate properties and homes you are looking for. A1 Mountain Realty will help you secure your very own piece of heaven when you purchase Homes for Sale in Ashe County NC and Ashe County NC Real Estate.